Warning, the following post may contain gratuitous images. Finished on Wednesday, worn on Thursday, worn again on Friday. Ruby from the Debbie Bliss Cashmerino Collection, size small, knitted in Cashmerino Aran. This soft, squashy knit has been my evening companion over the last couple of months. The soothing cables have meandered gently along providing comfort and pleasure. I love the clever construction of this knit, the entire body knit in one piece sideways and stitches picked up to create the collar and hem. The sleeves were reasonably easy to set in (although sleeve setting is never going to be my favourite occupation). The Cashmerino Aran is lovely to work with and although it is a chunky yarn it still makes for garment that is light and warm to wear. I did have two issues with this knit. I could not make sense the welt increases at the end of the main body. The pattern called for a y2rn increase with kfb worked twice into the y2rn on the following row. I tried, tried and tried again but even going down a needle size still produced huge holes. Eventually I had to work out my own method of increasing which has apparently left my memory now but I think I ended up settling on kfb twice on the first row and knitted the second row as written. My other big issue is the yarn quantity. This pattern comes in two sizes and the size I made apparently requires 20 balls with the larger size using 28 balls. I used 24 balls, I checked my gauge (anxiously) but it seems fine and the finished size is perfect. I think 4 balls is quite significant, especially given that this is quite an expensive knit. Luckily I had bought the yarn from my LYS and was easily able to get hold of the same dye lot but it did make an already expensive knit even more expensive. 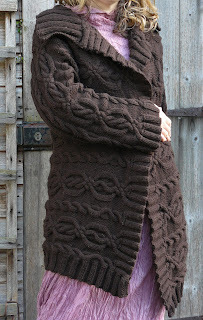 In spite of two negative points this has been a really enjoyable knit and I am delighted with the finished jacket. It is soft, light and cosy, a joy to wear. I love how it drapes around me, I love how it hangs. This jacket will see a lot of wear, it slots into my wardrobe perfectly and looks as good with jeans as it does with a dress. As you can perhaps tell from all these photographs, I am rather thrilled with this one. For you information, I was too impatient to wait for The Technical Advisor to take photographs so as soon as it stopped raining I dashed out with tripod. I do not have a remote to operate the self-timer, imagine if you will.......(and I took 26 shots in total). The strangest thing about all this is that the children observed all this madness and didn't even ask what I was doing?! Congratulations on your Ruby! The beatiful colour and detail to the construction makes it so unique. I can see a lot of fun wear to it and a permanent place in your wardrobe. So, enjoy every bit of it!